Year of construction: 17th and 18th c.
The oldest name of Vejzaksala island was Osmasar, it comes from Livic (Livonian) language. In 1239 Riga Archbishop confirmed the rights of Domkapitel (collegy of clergy) to use major part of this island - since then it was called - Domkungs island. In Swedish times the island belonged to Konrad Vegesack - his family gave to island its present name. Btw. island became mainland some time ago. At the end of 19th century manor house belonged to Andrew Stahl, afterwards - to Julius Stahl. Manor house had status of chivalry manor - it managed to retain it up to the beginning of 20th century. As a result city refused to maintain infsatructure in Vejzaksala, poor owner of manor dod not make any investments too and Vejzaksala gradually became neglected and swampy. Manor house has been shown in the work of J.C.Brotze (4., p.144. ), in copy from the map of 1700. back then it was small manor with 13 farmsteads and fishing rights in Daugava - these rights were handed over to farmers. Drawing of J.C.Brotze shows imposing Barocco style building with fachwerk. Koka Rīga, Rīga, Neputns, 2001, p.197. Broce J.K. Zīmējumi un apraksti, 2.sējums, Rīga, Zinātne, 1996, pp.144.,165. Ozoliņa D. Kā Rīgas "bruņinieku" muižiņas nonāca pilsētas pārvaldes pakļautībā (19./20.gs. mija), Senā Rīga. Pētījumi pilsētas arheoloģijā un vēsturē, Rīga, 2003, Latvijas Vēstures institūta apgāds, pp.332.,334. Rīgas ielas, 1.sējums. Rīga, 2001, p.40. 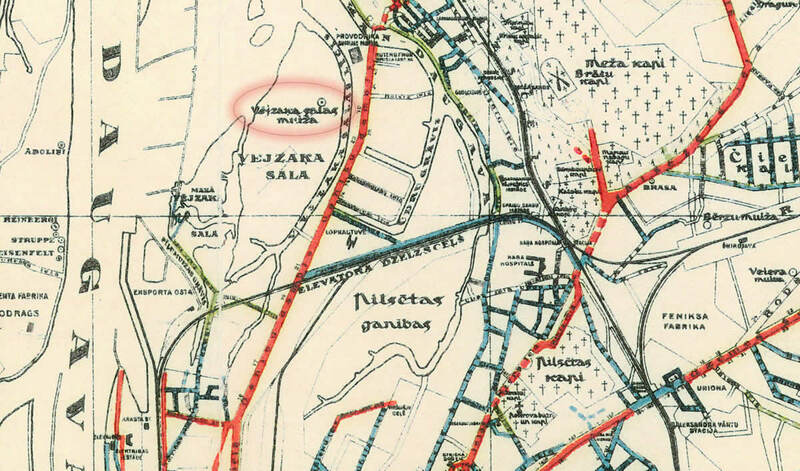 Rīgas plāns, 1:50 000, Rīgas pilsētas ielu bruģi un šosejas, 1930.g.